The first trees were planted in 1995. We also planted an experimental grove of more than 60 different varieties, which helped us to select varieties best suited to our unique conditions. Since Olives South Africa has the only olive processing plant in this area and the vast majority of these olives are processed at our plant. We also supply selected Pick & Pay and Spar outlets. A small quantity of our products is also exported to niche markets. Numerous Deli’s, Spa’s and up market outlets country wide. O.S.A possesses excellent information about the international market and knows a great deal about the common characteristics of their respected customers. O.S.A will leverage this information to better understand who is served, their needs, and how O.S.A can best communicate with them. O.S.A recognizes that this is an evolving process that requires multiple intervals of attention throughout the year. v Tunisia 2009: We were chosen out of 5 of the best international companies to set up a business plan and Implementation plan for a very large international company in Dubai which was destined for Algeria. v China 2010: Invited to accompany President Jacob Zuma on a state visit to China. v South African International Trade Initiative from 14 to 18 February 2011, in Moscow, Russia. v International Trade and Investment Initiative (ITI) India, 21 – 25 February 2011. For our Estate Extra Virgin Cold Pressed Olive Oil, only the best quality olives are handpicked at optimal ripeness and pressed within 24 hours of harvesting. The oil is stored in stainless steel storage tanks at just the right temperature until it is bottled in elegant glass bottles. This ensures top quality oil which can compare to the best in the world. All olives are handpicked at exactly the optimal stage of ripeness. We use an age old, traditional long, slow, natural fermentation process to preserve all the goodness and rich olive taste. The olives are fermented in brine for 9-12 months, before it is ready for packing. Only sea salt and water are used to bottle the fruit, no preservatives or colouring agents are added. Our range of table olive products consists of, Jumbo green, Manzanilla Green Kalamata and Natural Black – all in elegant glass jars of various sizes. Balsamic Vinegar is made from boiled grape must that matures due to slow acetification; the result of natural fermentation and steady thickening through a very slow ageing process in casks made of different woods, without the addition of any aromatic substances. A deep, dark, glossy brown manifests its density in an honest, flowing syrupy consistency. It has a characteristic perfume; complex and sharp, with an evident but pleasant and harmonic acidity. Of a traditional and inimitably well-balanced sweet and sour taste, it offers itself generously full and savoury, with velvety hints in accordance with its typical olfactory characteristics”. The range consists for example with products like Olive Oil with a complete Multivitamin and Mineral content, Olive Oil with Calcium and Olive Oil with Garlic. Now can enjoy all the health benefits of pure extra virgin olive oil in a convenient, easy to digest and gentle to swallow capsule. All these capsules are hermetically sealed to guarantee continued purity, freshness and potency. The combination of different herbs, vitamins, mineral and extra virgin olive oil results in a unique product range which provides optimum health benefits for the whole family. cutting edge patented technology, O.S.A formulated new combinations to bring you this unique new skin rejuvenating range. This range is the only South African product with at least 10% cold pressed extra virgin olive oil, Squalane, Promois WK, Vitamin Complex and Keratin. This range is also Paraben free. glycerin that attracts moisture in the skin. Olives South Africa can also supply a wide range of olive related products like Olive Jam, Olive Spread and Concentrated Olive Oil. ranging from one bottle of balsamic vinegar to custom-designed gift packs. Since most of our gift items are sold only at O.S.A Processing Plant or through our website, you are assured of giving something that is quite unique to South Africa. 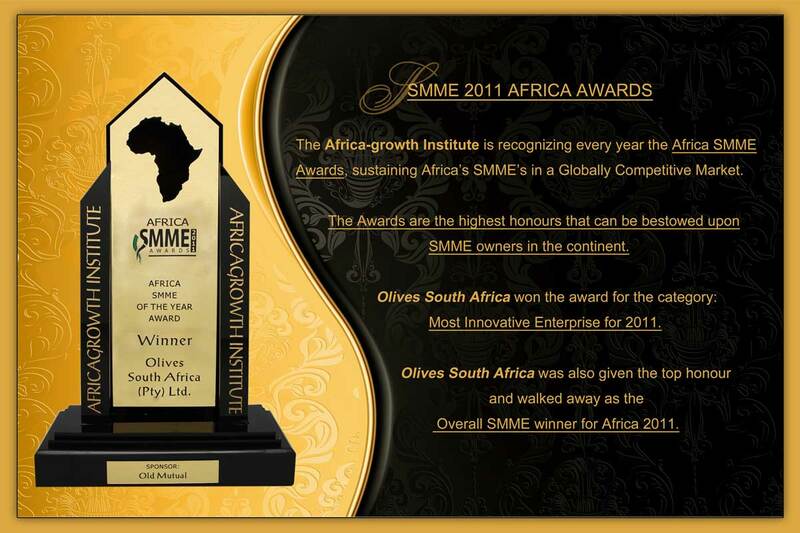 With years of experience and research in the Olive Industry, Olives South Africa strives to be part of the development of Community Projects, new upcoming olive farms and assistance to possible new farmers. It is always good to get firsthand knowledge from people in the same industry that has been down the same path. As far as we know, Olives South Africa are the only company that offer comprehensive business plans with the Metric eis tax relief scheme to support applications for financing to financial institutions with accurate facts presented in a professionally accepted format. Irrigation – layout and application. Soil and Leaf analysis to recommend corrective fertilisation options and optimum orchard layout. General consultation on the establishment of the grove which will include information on the layout of the grove and the actual planting of trees. orchard maintenance and soil and leaf analysis in support of a healthy tree and improved crops. The best quality are guaranteed at all times. We packed the pecan nuts in 500g – 5kg vacuum packed bags to guarantee freshness. The Pecan nut facility makes use of the latest and most advanced technology in the world and the only one of its kind in Africa at the moment. That reflects in the top quality pecan nut we are producing. Pecan-nut trees grow very fast and become very tall unless growth is controlled. It is regarded as one of the biggest fruit/nut crops. There are a large amount of cultivars available. We believe our unique product range. We have already exported successfully to countries like the USA, New Zealand and Switzerland, would give the up market international public a wider choice of Olives and Olive related products. The demand for olives and Pecan nuts are growing at a faster rate than production is increasing, and this creates a spirit of enthusiasm to grow from strength to strength.